Demand for electrified cars has surged in the last four years, with registrations increasing from around 3500 in 2013 to almost 119,000 in 2017. 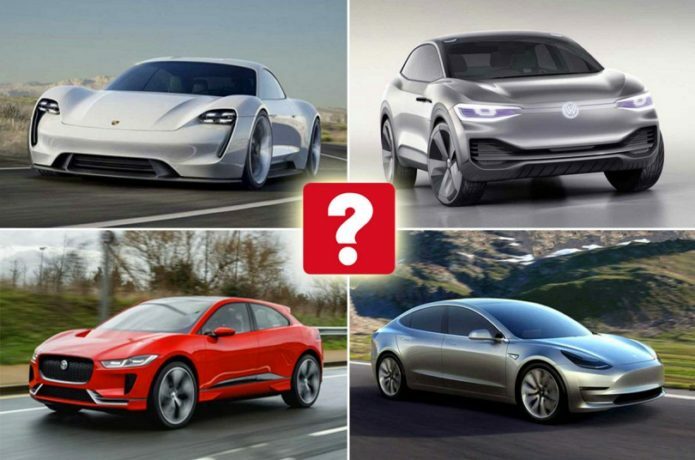 However, they still represented only 5.6% of the UK car market – and the majority of that was plug-in hybrids (PHEVs) rather than fully electric models. The reason for this is that most of today’s fully electric cars have quite a limited range between charges, making them unsuitable for long journeys. But a host of manufacturers are preparing to launch new models that solve this issue, while also offering stylish looks and innovative technology. Here we take a look at what’s coming when. If you want a luxurious fully electric car, then a Tesla is really your only option at the moment. But Audiwill change that when it launches its E-tron quattro SUV, complete with a range between charges of more than 310 miles. Audi’s sales and marketing boss, Dietmar Voggenreiter, has confirmed that the E-tron quattro will be sized between the Q5 and Q7, but closer to the Q5, and that it will closely resemble the E-tron concept (pictured) of the 2015 Frankfurt motor show. A second Audi electric car will follow in 2019, with this based on the E-tron Sportback concept from last year’s Shanghai motor show. A similar size to today’s Audi A7, it has the same sort of sleek, coupé-like roofline. Where the E-tron Sportback differs from the A7 is that it has the raised driving position and aggressive detailing that have helped make SUVs so popular. Power comes from three electric motors which produce a combined 496bhp and get the car from 0-62mph in just 4.5sec. Audi isn’t the only established prestige brand looking to break into the electric car market – Jaguar will also introduce its fully-electric I-Pace SUV in 2018. This has a motor on each axle, making it four-wheel drive, and a 395bhp output, which allows it to accelerate from 0-60mph in around 4.0sec. The I-Pace can also be charged in just over two hours from a standard charging point, or to 80% of capacity in 90 minutes, while its driving range is about the same as the E-tron quattro’s. After the I-Pace has gone on sale, Jaguar will unveil the replacement for its XJ luxury car. And the big news here is that instead of a like-for-like model powered by petrol and diesel engines, the new XJ will be excusively sold as an electric car. The XJ will also switch from a four-door layout to a five-door one, and will apparently serve as a technological showcase for the Jaguar brand. Between 2009 and 2010, Mini produced an experimental electric car (above) and leased it for trials. But from next year you’ll actually be able to buy a fully electric Mini E.
The new Mini E will be based on one of the company’s existing models, and Mini boss Peter Schwarzenbauer has said that it will feature “completely new battery technology” to make it far more usable than existing electric vehicles. Porsche’s answer to the Tesla Model S was first shown at the 2015 Frankfurt motor show, and is a four-door, four-seat, four-wheel drive supercar powered by two electric motors. The Mission E promises a 0-62mph time of just 3.5sec. And thanks to a new 800v charging system (twice as powerful as today’s quick chargers) it can receive an 80% charge in just 15 minutes. Revealed at last year’s Shanghai motor show, the Vision E is Skoda’s first electric car. However, it’s set to be the first of many, with the Czech brand stating that by 2025 one in four Skodas will be either a plug-in hybrid or fully electric. Expect the production version of the Skoda Vision E to be offered with a range of power outputs and to have five seats rather than the four of the concept. While Tesla already offers the Model S and Model X electric cars, the Model 3 will be its most affordable product ever, with a likely entry-level price of around £35,000. The Model 3’s pricing places it in competition with conventional executive saloons such as the Audi A4, BMW 3 Series and Mercedes C-Class. Orders are being taken now, but production of right-hand drive cars won’t begin until next year. The first ever Tesla wasn’t the Model S, but the two-seater Roadster. Sold between 2008 and 2012, this was based on the Lotus Elise, whereas its successor is all Tesla and said to accelerate from 0-60mph in just 1.9sec. The two-seat convertible is also claimed to have a top speed of more than 250mph and a range of 620 miles on a single charge – almost 300 miles more than any electric car on sale today. It’s styled to look like a coupé but features a removable roof panel. This Golf-sized hatchback will be the first in a series of new Volkswagen electric cars. What’s more, it will have a range of between 249 and 373 miles from a single charge, eclipsing the recently updated version of the Volkswagen e-Golf. By putting the electric motor at the back of the ID, Volkswagen says it has freed up space inside and given the car a tight turning circle that’s perfect for driving around town. The second new electric car that Volkswagen has planned manages to be both futuristic and retro. Called the ID Buzz, its design draws heavily on the Volkswagen Microbus, which gained fame in the 1950s as a practical and affordable MPV. The ID Buzz features seating for up to eight people in a configurable interior, with space for luggage at both the front and rear of the car. Plus, the steering wheel can be retracted into the centre console when the car is driving itself using a Pilot mode, which is scheduled to appear on production cars in 2025. The final car in Volkswagen’s electric revolution (at least for now) is a four-door SUV with coupé styling. Standout features include a system that ensures the air inside the car is pure, regardless of the amount of pollution outside. The ID Crozz also features a digital key that stores your personal preferences for things such as climate control and seating position so that it can automatically activate them as you approach the car. Volvo‘s first all-electric car is likely to take the shape of a small SUV and will be based on the same underpinnings as our 2018 Car of the Year, the XC40. Few other details have been revealed, but it should be among the safest cars you can buy given that the bigger Volvo XC60 posted the best Euro NCAP crash test score of 2017. It’s not just new battery-electric cars that are on the way, but also Hydrogen fuel cell models, such as the Hyundai Nexo. Hyundai was one of the first brands to sell a hydrogen fuel cell car in the UK, but while its first effort was based on the conventional ix35 SUV, this new car has its own distinct design and a range of 500 miles – 130 more than its predecessor. The Nexo will also have 20% more power than its predecessor and can be refuelled in as little as five minutes, while a price of around £50,000 is expected. As with all fuel cell cars, the only emission is water.